This is a collection of fragments from longer inscriptions that inventoried bowls (phialai) that had been dedicated in the wake of some actual or fictive legal action in which the dedicator had been successful in refuting the charge. There are 33 fragments of these lengthy lists in total, only some of which happen to involve associations of contributors (eranistai). The repeated legalistic pattern or trial scenario in these inscriptions is usually: "Defendant living in Place escaped Prosecutor 1 and Prosecutor 2: bowl weighing 100." In some cases an occupation is identified. There are a number of entries, presented below, that have an association of contributors as the second "prosecutor." There are two main scholarly views regarding the background of this, one long-standing and the other new (Meyer). While the majority of scholars view these inscriptions within the context of the manumission of slaves who, in a faux trial, were set free, Meyer (2009) proposes a novel theory that places these inventory lists within the context of resident immigrants (metics). In Meyer's view, these were dedicated as a tithe by unsuccessful prosecutors (often tax collectors) who had charged a metic for not having a citizen sponsor or for not paying the metic tax. Either way, groups of contributors are sometimes clearly involved as prosecutors (either former masters or tax-collectors). For further information on these inscriptions, see the Tholos website: http://www.tholos.org/phialai/. 1553, lines 7-10: Persis living in Place . . . escaped . . . Name from Rhamnous subdivision and the association (koinon) of contributors (eranistai): bowl weighing 100. 1553, lines 20-23: Synete living in Keiriadai subdivision escaped Nikodemos from Leukonoion subdivision and the association (koinon) of contributors (eranistai): bowl weighing 100. 1556, lines 26-29: . . . and the association of contributors. . . Name, seamstress (akestria), living in Keiriadai subdivision: bowl 100. 1557, lines 105-107: Lysichares . . . and the association of contributors . . .
1558, lines 37-43: Nikias, frankincence-dealer (lebanōtopolēs), living in Peiraeus escaped Philokrates son of Epikrates from Eleusis and the association of contributors who are with Theophrastos son of Bathyllos from Cholargos subdivision: bowl weighing. . . 100. 1559, lines 26-31: Bion living in Melite subdivision, engraver of gems (daktylioglyphos), escaped Chairippos son of Chairedemos of Halai subdivision and the association of contributors who are with Chairippos from Halai: bowl weighing 100. 1566, lines 26a-29: . . . Name son of Demostratos from Paiania subdivision. 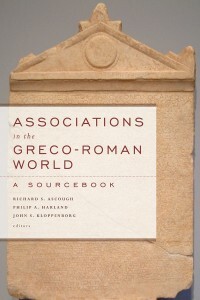 . . and the association of contributors (?) . . . living in Kolonai: bowl weighing 100. 1568, lines 18-23 (two related entries): . . . Chairippos son of Chairippos and (?) . . . the association of contributors: . . . bowl worth 100 (?). Sostratos, leather-cutter (skytotomos) (?), . . . living in Place escaped (?) . . . Chairippos son of Chairippos and (?) . . . the association of contributors: bowl weighing 100. 1569, lines 18-21: . . . Name living in Skambonidai subdivision and the association of contributors: bowl weighing 100. 1570, lines 24-26: . . . Slave-name, caulking-dealer (stuppeiopōlēs), living in Peiraeus escaped . . . Name son of Oinobios from Athmonon subdivision and the association . . . of contributors: bowl weighing 100. 1570, lines 57-63 (two entries): Slave-name. . . escaped Name. . . and the association of contributors: bowl worth 100. . . . Slave-name escaped Name and the association (?) . . . of contributors: bowl weighing 100. 1570, lines 82-84: Glaukias living in Hephaistiadai subdivision . . . escaped (?) . . . Euthydemos son of Name . . . and the association (?) . . . of contributors: bowl . . . weighing 100 (?). 1571, lines 8-10: . . . Slave-name living in Melite subdivision escaped . . . Name son of Sosistratos from Oathen . . . and the association (?) . . . of contributors: bowl weighing 100. 1572, lines 8-11: . . . Slave-name, caulking-dealer (stuppeiopōlēs), living in Place. . . escaped Name son of Dionysios (?) . . . and the association . . . of contributors (?): . . . bowl weighing 100. SEG 25 (1971), no. 178, lines 4-10: Elpis, flute-player (aulētria), living in Melite subdivision. . . escaped (?) . . . Leippos . . . living (i.e. not a citizen) in Melite subdivision . . . and the association (?) . . . of contributors . . . who are with Name . . . : bowl . . . weighing 100 (? ).